Archeoastronomy is the study of how ancient cultures understood various phenomena in the sky and how that played into their culture. Because archaeoastronomy is about the many and various ways people interacted with the sky, there are a diverse range of sources giving information about astronomical practices. One thing is clear - ancient cultures looked to the skies in awe and wonder. Much of the modern astronomy lore is based on ancient Greek and Roman mythology. Many of the current star names are derived from the Arabic culture. Eclipses were important events in many cultures around the world. How did the ancient people of the Americas, specifically here in the Southwest, see their place in the Universe? The Mayan counting was a Base 20 system (as opposed to our modern Base 10 or deci- counting system). The Mayan counting system was one of the first to use the concept of "zero". It was much more efficient than the Roman and Greek counting systems in use at the same time. The Mayan counting method used 3 symbols and can be compared to the binary system used by modern computers. The Mayan counting system was integral in the development of the Mayan calendars. The Mayans actually had 4 calendars to track time: The Tzolkin, Haab, Calendar Round, and Long Count. The Tzolkin calendar consisted of 260 days or 13 cycles of 20 days. We are not certain why 260 was chosen although it has been proposed to be related to the slight error in the 8/13 resonance between the Earth's 365.25 day orbit and Venus' 224.7 day orbit. The Haab or civil calendar consisted of 365 days. The Mayans appear to have been aware that a year is slightly longer than 365 days (365.24 days). The Tzolkin (13x20 or 260 days) and Haab (365 days) systems aligned every 52 years and was the basis of the Calendar Round. The Mayan Long Count is similar to our Julian calendar, the Long Count is simply a count of days since a particular starting point. That point is believed to be August 11, 3114 BC. The Mayans used a base 20 counting system and kept time in units of 20 days, called a uinal. Mayan observatories (like Chichen Itza ) were often aligned with the rising Sun, groupings of stars, and equinoxes. The Mayans were able to observe the spring and fall equinoxes with high precision because their locations near the Earth's equator made these observations easier. The Mayan observations rivaled anything done in Europe through the Dark Ages. Priests studied the movements of the Sun, Moon, planets and stars. The Mayans could predict the orbit of Venus and Mars with a fair amount of accuracy. Constellations of the Mayans included the Scorpion (our Scorpius), the Jaguar (now known as Capricorn), the Owl (Taurus), the Turtle (today's Gemini), and the Tale of the Rattlesnake (our modern Sagittarius). Chichen Itza: This is a square-based, stepped pyramid approximately 75 feet tall, constructed by the Mayans circa 1000-1200 AD, directly upon the multiple foundations of previous temples. The axes that run through the northwest and southwest corners of the pyramid are oriented toward the rising point of the sun at the summer solstice and its setting point at the winter solstice. Casa Rinconada: This is one of five great kivas in Chaco Canyon - 60 feet in diameter and 15 feet deep. Casa Rinconada was probably built between 1070 and 1110 AD. The symmetry axis defined by the two T-shaped doors is aligned with the North-South line to within 20 arcminutes. Shortly after sunrise on the summer solstice, as the Sun rises a beam of light shines through a lone window on the N-NE side of the kiva and moves downward and northward until it illuminates, on the interior West wall, one of the five larger, irregularly spaced niches in the kiva. Sun Dagger: At the top of Fajada Butte, along a narrrow ledge is a sacred Native American site given the name Sun Dagger. 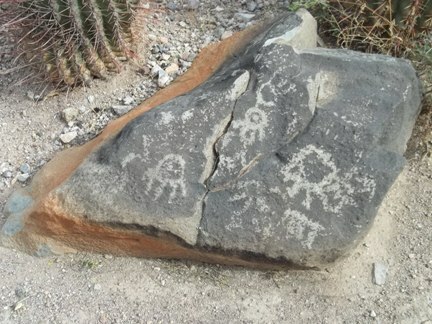 On the day of the summer solstice, a slender beam of sunlight passes between two rock monoliths, and bisects the center of a spiral-shaped petroglyph. Two parallel daggers bracket the larger spiral at the spring and fall equinoxes. The Sun Dagger formation is estimated to be a thousand years old, and was constructed by the Anasazi. 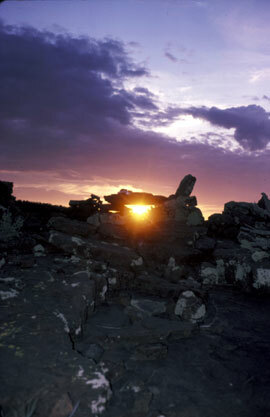 The sun dagger remained hidden until 1977 when it was rediscovered by archeologists studying the petroglyphs. Chimney Rock in southwestern Colorado was used by an outlying colony of the Chaco culture to mark the rising locations of the Moon during its 18.6 year (Saros) cycle. The ancient people constucted a "great house" near the feature to witness the event. 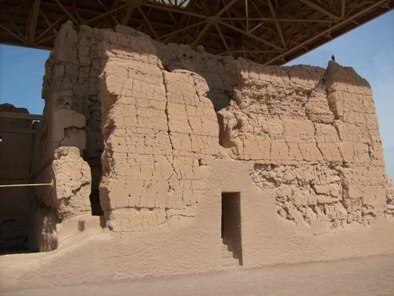 The true purpose of the "big house" at Casa Grande (located between Tucson and Phoenix) is unknown, however some evidence suggests the Hohokam incorporated their knowlege of astronomy into its architecture. They may have used a window in the west wall to record the setting Sun on the summer solstice (June 21st). Other windows and doors at Casa Grande align with the Sun or Moon at significant times of the year. The vernal equinox (Mar 21st) appears to be particularily important in determining when to plant crops. Archeoastronomy is not just limited to the Mayan culture and the people of Chaco Canyon. The Mogollon people that resided in what is now Otero County from 100 BC -1000 AD (and possibly earlier) established some primitive observatories referred to as Wizard's Roost and Wally's Dome. 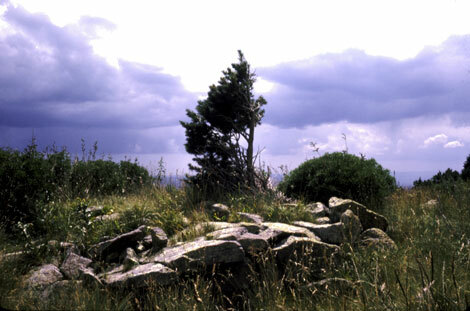 Wizard's Roost is located near the peak of Sierra Blanca and appears to be dated from 100 BC - 900 AD. From its location it appears that the winter solstice (Dec 21st) was its key alignment. Wally's Dome is located near Pajarito Peak, about 23 miles east of Wizard's Roost. Wally's Dome is composed of dry laid rock, a circle of boulders in a miniature "Stonehenge" configuration that is aligned with the summer solstice (June 21st). Other possible alignment features might correspond to the rising of Sirius. Prehistoric artifacts located in the area leads to dating around 1000 AD. The Mogollon people most likely used these structures to time agricultural events. Read Peter Eidenbach's report Wally's Dome and Wizard's Roost here. While the Three Rivers area north of Tularosa contains a significant number of petroglyphs - none at this time can be linked directly to any astronomical events.